Best known for its ALON® Transparent Ceramic (also known as Transparent Aluminum), Surmet is a pioneer in other advanced technologies including IR Optics Materials, Optical Coatings, Precision Optics Fabrication, Lightweight Transparent Armor design and solutions, and other related products. Granite projectile turns into dust upon impact, leaving no scratches on ALON (left). Glass window is destroyed (right)...click here watch the full video. Surmet is also a leader in magnesia Spinel Optically Transparent Ceramic, Aluminum Nitride, Dissimilar materials joining and surface modification technologies. Learn more at Products and Services. An Entrepreneur's Vision & a company's birth: interview with Suri Sastri by ACerS The American Ceramic Society Sep 9, 2015. ASM's AM&P Magazine, Nov 2015. ALON® is an amazing advanced transparent ceramic material with composition of Aluminum Oxynitride. It is extremely hard and durable, and is transparent in the near UV, visible and mid-IR wavelength regions. 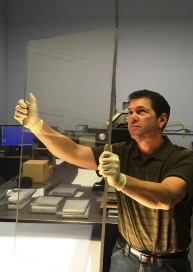 ALON is the hardest polycrystalline transparent ceramic material there is, and has been shown to stop multiple 50 caliber armor piercing (AP) rounds. Multiple ballistic performance test results have shown ALON to be the Best Transparent Armor Material that is available commercially today. In addition to high hardness and strength, ALON possesses good chemical resistance and high temperature resistance. Surmet has established manufacturing processes and technologies for producing high quality ALON powder and through green body formation, densification and optical fabrication. Surmet manufactures and supplies high quality ALON® components to military and industrial customers in sizes as large as 18x35-in and in large quantities. Surmet also supplies ALON domes and windows for infrared optics applications including IR guided missiles, sensor and reconnaissance pods for both ground vehicles and helicopters/aircraft. Learn More. ALON Transparent Armor Live Action Testing Video. Visit Surmet's Media Page to see videos of Surmet products in action. What can Surmet do for you? Surmet specializes in providing advanced materials based solutions to its customers.